Lead acid batteries consist of lead-dioxide cathode, sulfuric acid solution electrolyte, and sponge metallic lead anode. During discharge, lead sulfate, water, and energy are created by a chemical reaction between lead dioxide, lead, and sulfuric acid. During charging, an external electrical charging source converts lead sulfate and water to lead, lead oxide, and sulfuric acid. Lead acid batteries are robust and less expensive. They can deliver high currents and are available in different sizes and capacities. Lead acid battery is considered as the most recycled product in the world. The global lead acid battery market has been segmented based on product type and application. Based on product type, the global lead acid battery market has been divided into flooded and sealed type lead acid batteries. AGM and gel are the sub-segments of the sealed type lead acid batteries. Flooded lead acid batteries are widely employed in the automotive sector. They have the least cost per ampere hour vis-à-vis any other lead acid battery. Flooded batteries are wet cells, which are available in two types: maintenance-free and serviceable. Sealed lead acid batteries are commonly known as Valve Regulated Lead Acid (VRLA) batteries. The number of plates and their thickness determine their end-use/application. They do not tend to degrade or sulfate as easily as wet cells and are considered the safest batteries to use. There are primarily two types of sealed lead acid batteries: Gel Cell (gelified electrolyte) and AGM (Absorbed Glass Matt). AGM lead acid batteries employ an absorbed glass matt process. Gel sealed lead acid batteries contain gelified electrolyte. The global lead acid battery market is anticipated to expand at a CAGR of more than 4.8% from 2018 to 2026, and reach around US$ 79 Bn by 2025 in terms of value. Lead acid batteries are priced lower than their substitutes. This is the competitive advantage that lead acid batteries possess. Therefore, lead acid batteries are preferred by a large number of consumers. Low cost and reliability of these batteries is anticipated to drive their demand in the near future. The price of lead acid batteries is much lower than that of lithium-ion batteries. Therefore, the former is more attractive to consumers in developing nations. Automobile and manufacturing sectors are witnessing significant expansion. This is fueling the demand for lead acid batteries for UPS systems and inverters in several applications. Production of lead acid batteries has also increased. This, in turn, is driving the lead acid battery market. Rise in demand for stationary batteries for power backup and deep-cycle batteries for wheeled mobility such as golf cars, wheelchairs, and scissor lifts is an increasing trend in the lead acid battery market. This is boosting the market. However, lead mining extensively releases toxic smoke, including sulfur dioxide, dioxins, and dibenzofurans, into the environment. This is hazardous to life on the earth due to the contamination of soil and water. Improper and illegal disposal of lead acid batteries leads to pollution in drinking water and food produced from ingredients exposed to small and moderate levels of lead content. This is expected to restrain the market growth. In January 2018, Duracell launched a 12V AGM sealed lead acid battery at the 2018 CES conference in Las Vegas, the U.S. Duracell is the U.S. based firm, which is widely known for its small alkaline batteries. On February 13, 2018, three different lawsuits were filed against Aqua Metals for its recycling processes. However, the company announced a turnkey technical solution for the “sticky lead” problem of recycling of used lead acid batteries. This boosted the company’s share from $1.62 to close at $2.79 on February 15, 2018. SUNLIGHT Recycling is the Lead acid Battery Recycling Branch of . In 2014, the new recycling plant was developed in co-operation with Engitec in N. Greece (Komotini), with the recycling capacity of 25,000 tons of used lead acid batteries (ULAB) per year. Asia Pacific dominated the lead acid battery market with more than 50% share in 2016. Europe and North America followed the market in Asia Pacific in the same year. Increase in production of vehicles, rise in requirement of uninterrupted power supply, and fast growth rate in the renewable energy sector are primarily driving the lead acid battery market in these regions. The global lead acid battery market in North America, Europe, and Asia Pacific is expected to expand at a high CAGR during the forecast period. Market share of Latin America and Middle East & Africa is also anticipated to increase, but at a slow pace, till 2025. Key players operating in the global lead acid battery market include EnerSys, EXIDE INDUSTRIES LTD., JOHNSON CONTROLS INTERNATIONAL PLC, and GS Yuasa Corporation. Other players operating in the market include First National Battery, NorthStar., Amar Raja Batteries Ltd, HOPPECKE, Exide Technologies, HBL Power Systems Limited, C&D Technologies, Inc., East Penn Manufacturing Co., FIAMM Energy Technology S.p.A., Crown Battery Manufacturing Co., and Trojan battery Company. Lead acid battery is a type of secondary energy storage battery where chemical energy is converted into electrical energy and vice versa. The conversion of electrical energy to chemical energy is termed as charging of a battery, while conversion of chemical energy to electrical energy is termed as discharging of a battery. Lead acid battery consists of a lead-dioxide cathode, sulfuric acid solution electrolyte, and sponge metallic lead anode. Lead acid batteries are less expensive, robust, and tolerant to overcharging. They also have low internal impedance, indefinite shelf life, and can deliver high currents. Flooded lead acid batteries are the commonly utilized batteries. They are widely employed in the automotive sector. They have the least cost per ampere hour vis-à-vis other lead acid batteries. Flooded batteries are wet cells. AGM lead acid batteries employ an absorbed glass matt process, wherein highly porous and fine microfiber glass separators engross the electrolyte, thereby increasing the efficiency by dropping internal resistance. This, in turn, increases the capacity. AGM sealed lead acid batteries are tolerant to a wide variety of temperature. They are less expensive than gel sealed lead acid batteries. Li-ion is expanding at a rapid pace in the lead acid market; however, demand for lead acid batteries is still rising due to their low cost and high performance. The trend of using stationary batteries for power backup and deep-cycle batteries for wheeled mobility such as golf cars, wheelchairs, and scissor lifts has been rising. This is driving the lead acid battery market. In terms of product type, the flooded segment accounted for more than 60% share of the market in 2017. Market share of the segment is likely to rise significantly by the end of the forecast period owing to high demand from automotive and motorcycles segments. In terms of application, the automotive segment holds the major share of the lead acid battery market. It is followed by the motorcycle segment. This trend is likely to continue throughout the forecast period. Lead acid batteries are primarily employed for starting, lighting, and ignition purposes in automotive and motorcycles. Asia Pacific held significant share of the market in 2016 in terms of value and volume. The region is expected to continue its dominance throughout the forecast period. The market in Europe and North America is likely to expand at a significant pace in the near future. This report analyzes and forecasts the market for lead acid battery at the global and regional level. The market has been forecast based on revenue (US$ Mn) and volume (thousand units) from 2017 to 2026, considering 2017 as the base year. The study includes drivers and restraints of the global lead acid battery market. It also covers impact of these drivers and restraints on demand for lead acid batteries during the forecast period. The report also highlights opportunities in the lead acid battery market at the global and regional level. The report includes detailed value chain analysis, which provides a comprehensive view of the global lead acid battery market. Porter’s Five Forces model for the lead acid battery market has also been included to help understand the competitive landscape. The study encompasses market attractiveness analysis, wherein product type and application are benchmarked based on their market size, growth rate, and general attractiveness. 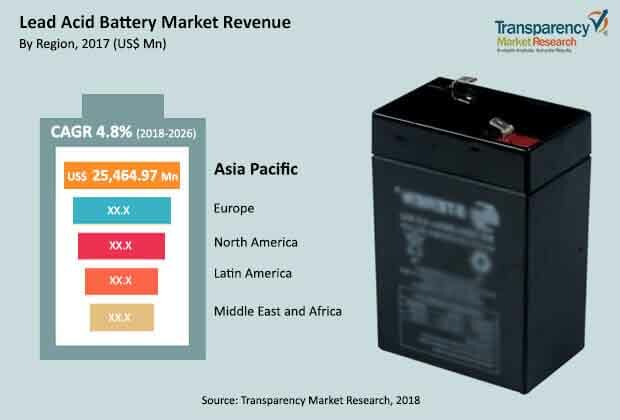 The study provides a decisive view of the global lead acid battery market by segmenting it in terms of product type and application. In terms of product type, the lead acid battery market has been classified into flooded and sealed. The sealed product type segment has been sub-segmented into AGM and gel. In terms of application type, the lead acid battery market has been segregated into automotive, motorcycles, motive power, renewable power, UPS & telecom, and others. These segments have been analyzed based on present and future trends. Regional segmentation includes current and forecast demand for lead acid battery in North America, Europe, Asia Pacific, Latin America, and Middle East & Africa. The report provides the actual market size of lead acid battery for 2017 and estimated market size for 2018 with forecast for the next eight years. The global lead acid battery market has been provided in terms of revenue in US$ Mn and in terms of volume in thousand units. Market size has been provided in terms of global, regional, and country level market. The report comprises profiles of major companies operating in the global lead acid battery market. Key players operating in the lead acid battery market include EnerSys, EXIDE INDUSTRIES LTD., JOHNSON CONTROLS INTERNATIONAL PLC, and GS Yuasa Corporation. Other players include First National Battery, NorthStar, Amar Raja Batteries Ltd, HOPPECKE, Exide Technologies, HBL Power Systems Limited, C&D Technologies, Inc., East Penn Manufacturing Co., FIAMM Energy Technology S.p.A., Crown Battery Manufacturing Co., and Trojan Battery Company. The market for sealed lead acid battery products is smaller as compared to the market for flooded lead acid battery products, due to the high demand from automotive and motorcycle application segments. Lead acid batteries are majorly employed for starting, lighting, and ignition in automotive application. Flooded lead acid battery is more suitable due to its quick surge of energy for automotive application. On a global scale, 80% of the lead acid batteries produced are recycled. Lead acid battery is the most recycled product. The flooded segment is anticipated to expand at a fast pace during the forecast period. AGM sealed lead acid batteries are less expensive than gel sealed lead acid batteries. Therefore, these are gaining popularity due to their high performance in varied temperatures. Automotive and motorcycle application segments held more than 60% share of the market in 2017. This trend is expected to continue throughout the forecast period. In terms of region, Asia Pacific is anticipated to dominate the lead acid battery market during the forecast period.